I said that I wouldn’t be blogging any more but a habit of two years is hard to leave behind. Plus, I keep thinking about you guys out there and feel as if I am cutting a connection. So, what I have done is started a new, more targeted blog called Sticky Knowledge where I’ll be writing about how we work and think and learn. I’m going to be posting simultaneously here and there for a bit but if you want to come over, eventually, there will be information there that you can’t find here. I’ll keep this one for the goofy other stuff, except for the goofy stuff about how we work, learn and think. I got this as a link from one of the bajillion e-newsletters that I subscribe to. This one is SmartBlog on Leadership and often has a nugget to two worth thinking about. That, combined with the fact that a new copy seems to hit my inbox about 700 times a week makes it somewhat troublesome. I feel obligated to give it a glance before letting is drop off the top of the Inbox. This was the nugget I found for today. I like it for several reasons. One, the writer takes a very bold position. Two, her thinking matches mine; what she finds troubling I find troubling. I noticed that she works for herself, like many agitators/provocateurs, as do I. And that makes me wonder, if I agree with her and feel righteous about my position, am I then a member of her Groupthink? I don’t think so because I’m still thinking about it but it’s still sort of a dichotomy, don’t you think? Give it a read and see. Want to build a start up? Start here! If you have read the Start Up Owner’s Manual. . . or if you haven’t, and you need to understand what it takes to build a new business, there’s a great online course for you at udacity.com. It’s a series of lectures that covers the entire book delivered by Steve Blank, one of the two authors. The work is all on you to create but they provide the information foundation. I’m beginning to understand the Business Model Canvas at the level that I need to understand it. I could get a bit of it from the book Business Model Generation but this course is making that canvas MUCH clearer. Steve Blank and Bob Dorf’s concept on customer discovery and validation is flat out BRILLIANT! Don’t take my word for it. Read reviews of the book or watch the lectures. And here’s the best part of the rest of the story. . . it’s FREE!!! Oh, not the book, the course. Get both. Don’t miss the new Sketchnoting workshop! Have you seen Sketchnoting and wanted to do it but you don’t know how to start? This is a sketchnote of the story of The Three Little Pigs. If this is something that interests you, you’ll get a little more of it at TEDx San Antonio, where we’re going to try out collaborative sketchnoting. What has come out of that is that it’s time to do another sketchnote workshop. This time the focus is going to be on building your visual vocabulary. You can find out all the details by clicking on this link. 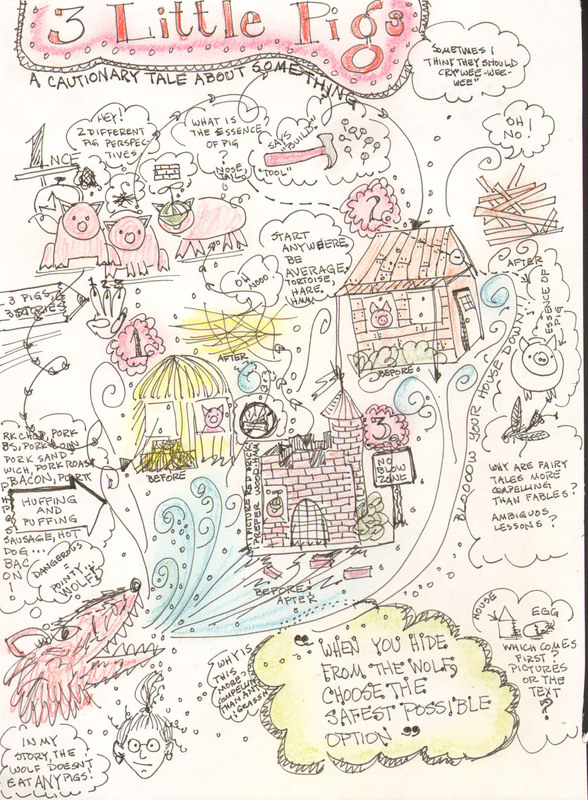 If you want to see more examples of Sketchnoting, google it. Every sketchnoter has his or her own unique style. You can also poke around here to see more of my examples. And I’ve been thinking about all these gadgets in my house, and my purse, and my car and the fact that they are all only the receivers of different data channels. These include my TV, DVD player, numerous computers, my smart phone, my digital cameras and digital recorders, my scanner, the antenna on the roof, the radio and stereo, the house phones. This variety of receivers is keeping me away from ebooks for now. Come on! Another single purpose gadget. Really? Then I thought, AHA!!! That’s why we need to have something like a PLE map, so that we have a physical representation of what we want in a universal media channel. And then I thought about Symbaloo and realized that what those tools, and my iGoogle to some extent, are attempting to do is to collect all of these disparate data streams into a more universal channel. But what we’ve got is a scrapbook of data feeds. . . for now. Then I wondered about how we would then add in the human to human interaction and realized that once I took notes about conversations and digitized them, I added in my human to human records. Or I used my digital phone and recorded the conversation and tagged it. So smell, taste and touch are out for now, but that’s about it. Anything that we see and hear can be digitized (and often is). What is my role then as libarian of my personal knowledge? How long does it take me to weed out the junk and catalog the rest? Is this what I also rely on PLE-type services to provide for me? Is this where we get to avatars? So is all of this coversation about PLEs merely a precursor to a gadget that receives universal media streams? Is this what a really good netbook becomes? So you want to start an online course? I wrote earlier about an online course that I was really excited to have signed up for. Unfortunately, my excitment has waned, to the point of leaving the course. It wasn’t what I have come to expect from online learning, a medium that with careful thought may have begun to come into it’s own power. There was little that was thought provoking, even though there were many really interesting experts from many interesting fields taking hte course. The problem was two fold — a lack of energy on the facilitators part combined with a desire to tightly control the experience. If your goal is to deliver information, then truly content is king. 100% focus on the quality of the content. If you want to host a learning event, content is 30%, the learners are 30% and facilitation is 30%. The other 10% is magic. I said I was done and I thought I was. Blogging, that is. But these two TED talks are so good that they required a new post. And this one second, http://www.ted.com/talks/brene_brown_listening_to_shame.html.